If you’re one of the 10 million people in the UK living with hearing loss, you’ll know all too well that we take our ears and hearing for granted. Yet deep within our skull is an incredible set of highly sensitive instruments with the ability to transform simple vibrations into the beautiful music, interesting conversations and mellifluous birdsong that our brain understands. So how does it do it? Come with us on a journey through the ear canal and into the inner workings of the ear to find out how the magic of hearing really works. The ear is made up of the outer ear, the middle ear and inner ear. Naturally we’ll start with the outer ear, which receives sound waves, aided by the shell-like cartilage that forms the most recognisable parts of the outer ear. In fact, the outer ear is more ‘inner’ than its name suggests – this part of the ear also includes the ear canal (which is about one inch long) and the ceruminous and sebaceous glands, which produce the protective ear wax that cleans and lubricates our ear canals. Why do we have two ears? Wouldn’t one do the job just as well? It’s so we can sense the arrival time of any given sound, which tells us the direction the sound is coming from. If the sound reaches your right ear before it reaches the left ear, the sound is probably coming from your right-hand side. Once we reach the end of the ear canal, we arrive at the eardrum and the start of the middle ear. The eardrum – also called the tympanic membrane or myringa – is the first part of the human body’s biological microphone that translates sound vibrations into electrical signals the brain can understand. The eardrum receives the sound vibration and amplifies it through three small bony structures called ossicles. The ossicles are suspended by a number of ligaments, letting them respond and move with the vibrations as they pass through. The ossicles can amplify the power of a sound by up to 15-20 times, passing this on to the inner ear, where the vibrations (sounds) are transmitted into the fluid of the cochlea and converted into electrical signals. Once in the complex bony labyrinth of the inner ear, the sound waves are transmitted into the cochlea, which contains super-sensitive hair cells, called epithelial cells, that act as transducers – converting the physical sound vibrations into electrochemical pulses. These pulses are then carried to the brain via the snappily titled vestibulocochlear nerve, where our brain makes sense of the signals to form the rich sonic landscape we hear around us. 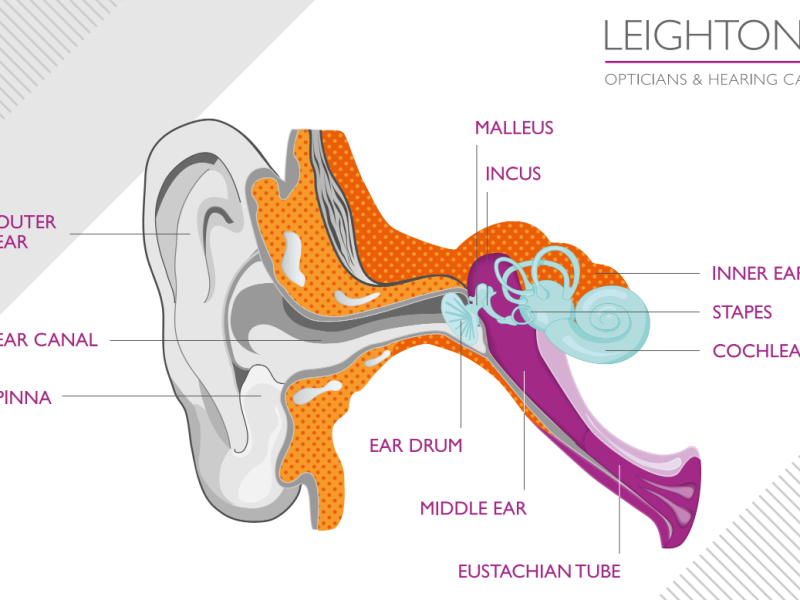 As you can see, the ear is a complex and delicate piece of physiology – and much like the rest of your body, it needs to be looked after. However, age-related hearing loss can creep up on us over the course of many years, so it’s worth getting your hearing tested regularly (just like regular eye tests). Book your hearing test appointment online or call us on 0800 40 20 20.